Dichroic beamsplitters (mirrors) are used as light guiding optics, intended to reflect a specified range(s) of wavelengths and transmit a different specified range(s) of wavelengths at a specified AOI, typically 45 degrees. Most of Chroma’s catalog dichroics are intended for use at 45 degrees AOI, if unsure please ask us. Dichroics are a necessary component of filter sets used in epifluorescence configurations. Chroma manufactures UltraFlat dichroics for laser applications demanding superior levels of surface flatness, such as TIRF and other super-resolution techniques. We offer UltraFlat dichroics either for use as individual parts or included in assembled filter sets. However, the secret with flat dichroics is that they need to stay flat in your imaging system. Filter cubes that use clips, springs or screws to hold dichroics will torque them out of flatness. Chroma's TIRF & Super-resolution filter cubes keep your dichroics just as flat in your microscope as they were when we made them. Most of our dichroics intended for more routine widefield fluorescence applications neither have nor require high levels of surface flatness but still deliver the other performance advantages of sputtered interference filter coatings. 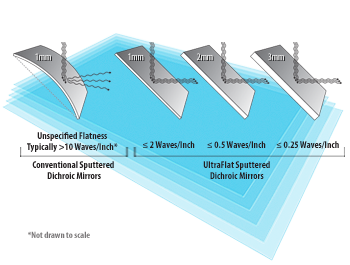 Learn about Chroma's UltraFlat Dichroic thickness options for distortion-free imaging. For applications where surface flatness is critical, such as TIRF, STED, SIM and image-splitting, thicker and flatter dichroic options are available after adding to cart. For use with lasers or critical applications requiring very flat reflective surfaces, you may choose an UltraFlat version of this product after adding to cart, availability may be limited. For use with lasers, please see our catalog UltraFlat Laser Dichroics. © 2018 Chroma Technology China. All rights reserved.